2013 was a big year for the LoveCats: two cats were nominated for Ruby Awards (Australia’s premier award for romantic fiction), two Cats were nominated for a total of six ARRA awards, one Cat had a book deal with The Bold & The Beautiful, and there were a whole slew of of other awards and nominations, including an Honorary Life Member of RWAustralia! Plus, collectively, the Cats published thirty-five new books in 2013. Bronwyn Jameson was presented with the Honorary Life Member Award by Romance Writers of Australia. Congratulations, Bronywn! Amy Andrews was nominated for an RT best book, was a three-time finalist in the ARRA Awards, won a Cataromance reviewers choice award, had a couple of BJCA Awards, hit #13 on the Amazon top 100 series books (paid), and published 7 new books (3 Medicals, 3 KISS and a single title romance with Momentum). She also signed a deal to write a book set in the world of the T.V. show, The Bold & The Beautiful. 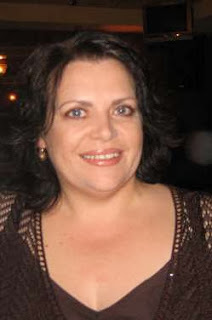 Annie West won a CataRomance Award for Defying Her Desert Duty, and was a finalist in the following Australian Romance Reader Awards: Favourite Short Category Romance – both ‘Undone By His Touch’ and ‘Defying Her Desert Duty’, Best First Meeting Between a Couple in a Romance Published in 2012 - both ‘Undone By His Touch’ and ‘Defying Her Desert Duty’, Best Love Scene From a Romance Published in 2012 – ‘Defying Her Desert Duty’. 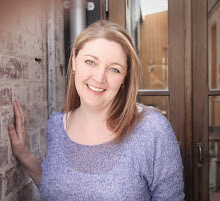 She also finally gave up the day job and became a full-time writer, and gave her first solo writing workshop (at the RWAus conference in Fremantle). She published three new books in 2013, Captive in the Spotlight, Imprisoned by a Vow and An Enticing Debt to Pay. Michelle Douglas won the Book Sellers' Best Award in the Traditional Category for The Nanny Who Saved Christmas, was a double finalist for the Colorado Award of Excellence (The Nanny Who Saved Christmas and The Man Who Saw Her Beauty), and a finalist in the Golden Quill (The Man Who Saw Her Beauty). She had 3 Sweet Romances published this year: First Comes Baby..., The Cattleman's Ready-Made Family, The Redemption of Rico D'Angelo. Louisa George was nominated for RT Best Book in Harlequin KISS series, hit the #1 spot on Amazon for medicals with How To Resist A Heartbreaker, had a RT Nomination, Best Harlequin KISS 2013 for Backstage With Her Ex, and also hit #1 on the Amazon Bestseller Harlequin KISS series list. This year she published two medical Romances: The Last Doctor She Should Ever Date and How To Resist A Heartbreaker, and 1 Harlequin KISS/Modern Tempted, Backstage With Her Ex. Helen Lacey was nominated for a Ruby Award for Marriage Under The Mistletoe, and published two books with Harlequin Special Edition, His-And-Hers Family, and Date With Destiny, as well as one indie book, The Cattleman’s Proposal. Sue Mackay published three books with Medicals, Christmas With Doctor Delicious, The Gift of a Child, and The Infamous Maitland Brothers. Sue also hit the #1 spot on Amazon for Medicals. 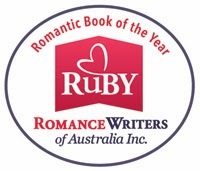 Yvonne Lindsay was nominated for a Ruby Award for A Forbidden Affair, and published her 25th book! She had three new books out with Desire, One Secret Night, Something About The Boss…, and The High Price of Secrets. 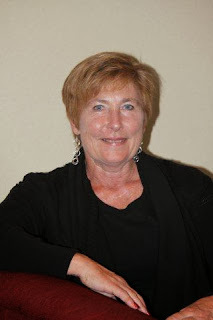 Barb De Leo had two books published with Entangled, Dishing Up Desire and Last Chance Proposal. She also sighed for two more books with Entangled. 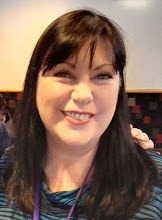 Rachel Bailey presented a workshop on sexual tension at the RWA national conference in Fremantle, and published two books with Desire, No Stranger To Scandal and Countering His Claim. Jennifer St George had two new releases in 2013, The Love Deception and Seducing the Secret Heiress, as well as a print compilation of The Convenient Bride and Seducing the Secret Heiress, titled Sweet Seduction. She had a sell-out book launch at Mary Ryan's Byron Bay and has been approved to teach Introduction of Romance Writing at the Byron Community College next year. Sharon Archer focused on non-writing activities in 2013, including a crossing of The Simpson Desert, which is the world's largest sand dune desert! We were all amazed by that achievement. Emmie Dark had one book out with Superromance, Just For Today, two books with Destiny, Spellbound and Charmed, and a self published book, Dance With Me. She also accepted a big job in the U.S., and so is leaving the LoveCats in the New Year. We’ll miss you, Emmie! So, tell us, what did you achieve in 2013? It might be big or small, but we'd love to hear what your achievements were.  ... the winner of last week's Sunday Smooch Giveaway is Kailee. 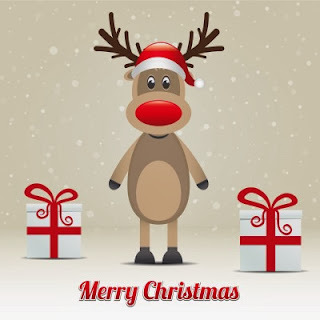 Happy Christmas to you all! Hope your day was love-filled and blessed. This year we decided to do something we'd never done before and take a holiday the week before Christmas. 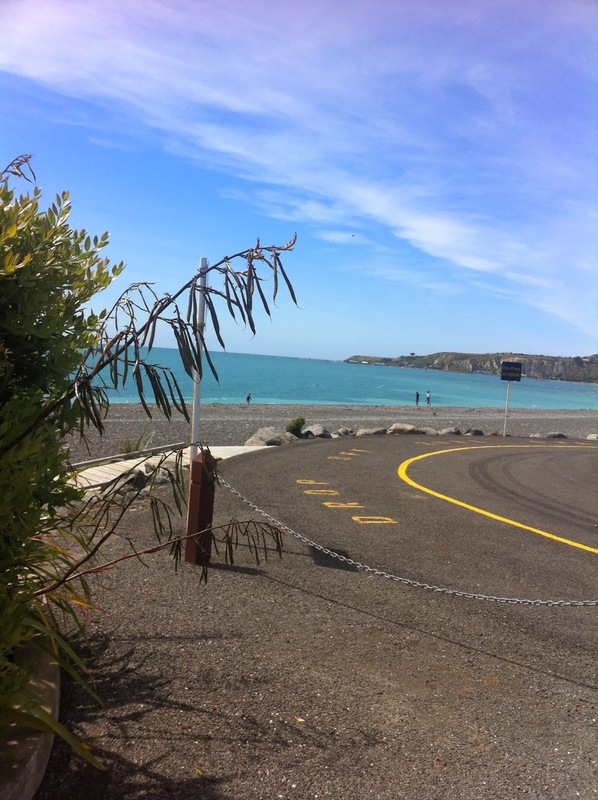 The main motivating factor was that my sister, her husband and 4 year old were coming out for a holiday from the UK- so we thought we'd take a trip to a part of NZ that none of us had explored before. Lovely idea! (But it did mean we had to plan well ahead and get everything ready for xmas a lot sooner than everyone else due to the fact we were not getting home until 23rd December). It was lovely to get away from the hurly burly of the city and everyone else's frantic preparations and we had a great time (despite unpredictable weather). Added plus: we saw the world from my nephew, Bobby's, point of view- and boy, was it fun! I'd forgotten just what life is like with a little one. When the world is thinking about material stuff it is so refreshing to be reminded about what really is important- the wonder of nature. Simple things. And then it did this! 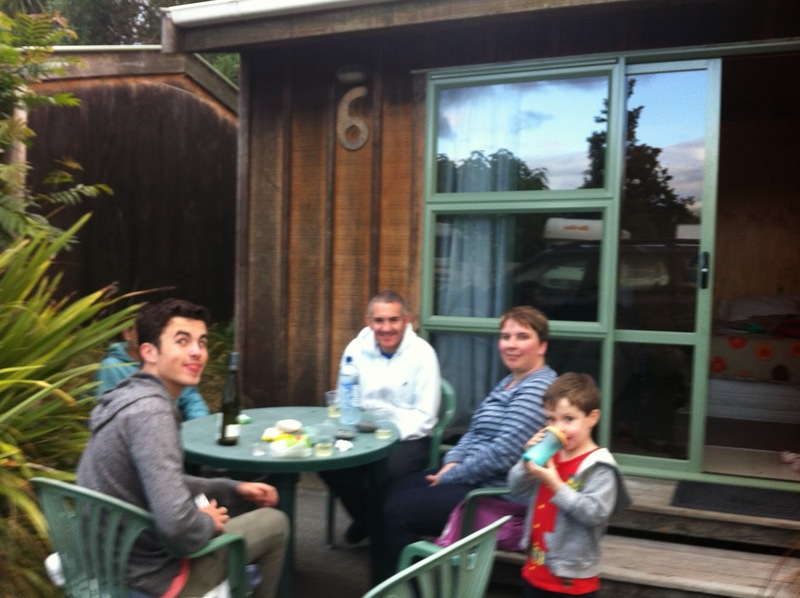 We stayed in cabins at a campsite that were basic but comfortable- although Bobby called them sheds- which had us all smiling… and from now on we always try to stay in sheds! 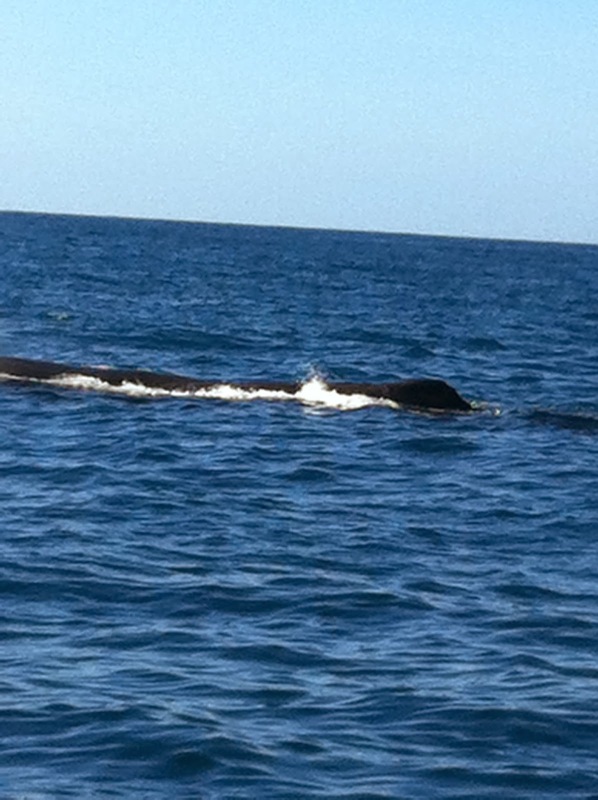 But the very best thing of all and the most fun for everyone was…. throwing rocks into the sea…. Such a great time was had by all! ...and a New Zealand Christmas song! Warmest wishes for your Christmas Day! So it was my birthday on Saturday. Also, I might add, it was Sharon Archer’s the day before – happy happy Sharon! But this time of year is always taken over by Christmas stuff so birthdays kind of get lost in the tinsel and trees of the season. That’s fine by me because I really, really, really love Christmas! Everything from the piped carols in shopping centers to the excitement of opening presents Christmas morning. And the food, of course. The thing I love most about Christmas Day is the plum pudding and, as such, it’s my job every year to make it. So tomorrow I’ll soak the fruit and Christmas morning (when I get home from work!!) I’ll mix it all up and put it in the basin and let it boil for three hours. And then I’ll make the custard – on cream of course! Yum…can’t wait! But this year I decided I’d also do a frozen ice-cream Christmas pud – given that it’s supposed to be 38 degrees on Wednesday, I think it’ll go down a treat! So that’s what I’ve been doing this morning – making ice-cream magic and, being the food constructor that I am, it’s the easiest and quickest thing to make. Take cranberries, raspberries, pistachios, crushed up pavlova nests, white choc-chips and some crumbled up cheap fruit cake. Actually – you can add whatever you like to the mix, everything goes with ice cream, right?! Smoosh them all into 2L of softened good quality vanilla ice-cream. Once it’s all mixed in, place into a pudding basin lined with cling wrap. Make sure the cling wrap drapes over the sides. Place in freezer. To turn out just pull on the excess cling wrap and invert. Mmmm, cool heaven! I’ll tweet and Facebook pics on the big day to let you know how it turns out! Do you have a favourite Christmas Day food? I hope everyone has a merry Christmas and a safe and happy holiday season. See you all here in 2014!! in the garden proves Charlie's moved on even if he hasn't. Charlie Lang has spent months trying to find US Army medic Marshall Hunter to tell him he's the father of her daughter, and suddenly he's turned up out of the blue and has learned the truth. What he doesn't know is why it is so important that he's a part of his daughter's life. 'Hey." A shadow fell across Charlie. 'I can go with that.' More than she'd expected, less than she'd hoped for. She stood before Marshall, studying him. Butterflies spread their wings in her stomach, fluttering wildly as she noted the well-honed muscles of his upper arms. She'd missed him. Two weeks of wild passion and she'd spent the intervening years thinking and dreaming about him, wondering how he was, where he'd gone, who he might be with. And now he stood before her, looking superb in his casual attire. Leaning forward, she stretched up onto her toes and reached for his mouth with hers. When her lips touched his all those long months of yearning disappeared in a haze of heat. It was as though they'd never gone their separate ways, as if the intervening time had been a figment of her imagination. Her hands slid around his neck, pulled him closer so she could deepen her kiss and press her tongue to his mouth to slide inside. And then Marshall was hauling her up against his hard body, his hands splayed across her back as he held her to him. His lips claimed her mouth with a hunger that surprised and shocked her. Marshall had missed her, too. His tongue danced around hers. Her body melted into his, trying to become one with him. She forgot everything except Marshall. His arms holding her, each one of his fingers pressing into her skin under her T-shirt like hot brands, his hard thighs that reached as high as her hips, that taut belly against her soft baby tummy. His hardening reaction to her. "I'll take the beers outside to the veranda." Her father's quiet voice pierced her euphoria, returned her to normal quicker than anything else could've. Marshall is a medic in the US Army. Does a man in uniform turn your head? Or do you go for the jeans and tee, or the business suit? Come back next Sunday, when the winner of today's giveaway will be announced will be posted! Since Christmas and the holiday season is only a few days away I thought it would be fun to blog about what makes this time of year so special. 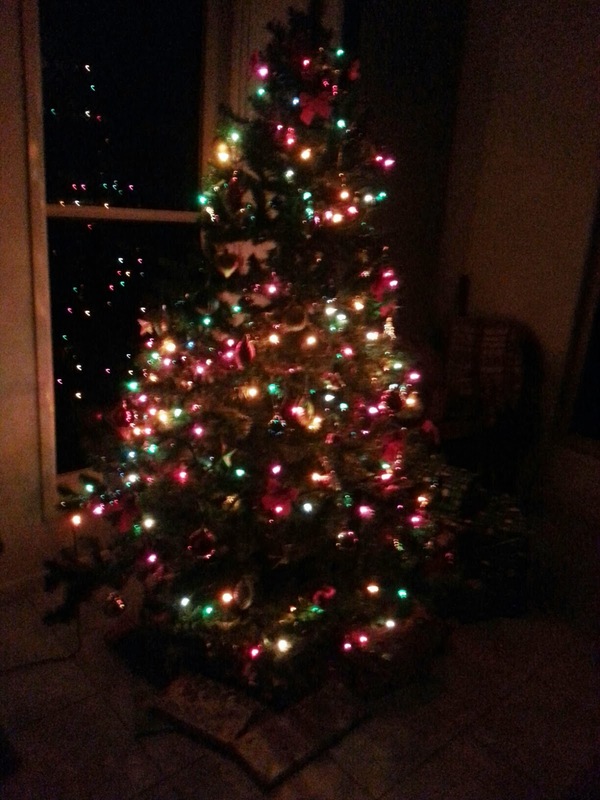 2) Christmas Tree! I love putting up the tree on December 1st. 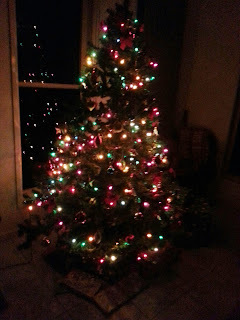 Well, hubby actually puts the tree up and does the lights and then I do the ornaments – which include jewel coloured baubles and cute little red velvet bows. But no tinsel. I remember as a child my parents would hang tinsel ALL over the house. From the picture below you see where one of my cats has been climbing the tree and moving said lights. 3) Food! Is there any time more designed for overeating that Christmas time? The ham, turkey, seafood, trifle….sigh…. I come from Welsh parents and my mother would always cook pork, beef and turkey for Christmas day, even in the sweltering Australian heat. These days we tend to do colder options, but the feastness (that’s a word I just made up) is still the same. Once Christmas and Boxing Day are over I always feel like I’ve been eating non-stop (and probably have) and don’t care if I never see another prawn or slice of ham. Thankfully this feeling wears off. 4) Family! Definitely the best part of Christmas. I live in a small regional town and many members of my extended family are scattered through several states, so some years there’s ten people and other years twenty or thirty. But no matter how many of us get together there’s always plenty of laughter and long talks about Christmases from years gone by. 5) Friends! Equally the best part of Christmas. 6) Pets! It’s no secret I am animal crazy (It’s not like I’m going to end up on that TV show Animal Hoarders or anything) I always get my two outside puppies a special bone-ish treat and my inside dog Samantha has a fabulous festive collar for Christmas Day. I have trialled the cat’s with their red velvet collars but neither were impressed. 7) Presents! Oh, did I cover that already? Well, since it’s Christmas I have a giveaway from any of my backlists books to one commenter. Tell me what you love about Christmas and I’ll draw a winner on Monday. Winner of Annie West's Christmas Giveaways! If you email me at annie(at)annie-west(dot)com with your postal addresses I'll get your books packaged and sent. December has crept up on me. I've been so busy writing I just looked up to discover Christmas is fast approaching. How did that happen? Seeing the cover reminded me of what fun I had, living in sunny Australia and writing about a wintry kingdom with a castle in the mountains, cobblestoned streets, colourful Christmas markets and even a sleigh ride. It also reminded me of a recent chat I had with fellow LoveCat Michelle Douglas about the joys of European Christmas markets. So of course I had to dig out my research photos. They made me smile so much I thought, in the interests of spreading some pre-Christmas cheer, I should share a few with you. The markets are a great way to sightsee. 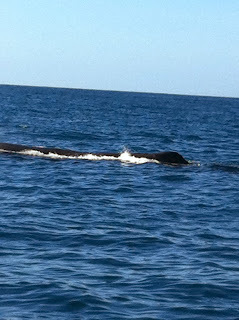 It wasn't just about sightseeing, even though some of the sights looked pretty spectacular. When you visit the Christmas markets on a chilly evening you want to bring something back for your efforts. Maybe a decorated gingerbread heart to hang in your window or carved and painted wooden Christmas ornaments for your tree. One year I was thrilled with a purchase of comfy cable-knitted socks that come up to my knees - perfect under boots! There are Christmas wreaths, pewter, pottery, teas, candles, even kitchen gear and spices. Of course, one of the best things about the markets is the food. On a cold night there's nothing quite like a cup of hot, spiced (mulled) wine. Then there are the grilled sausages (the original hotdogs) with mustard and onions, gingerbread, stollen (European fruit bread topped with icing sugar) and chocolates. One of the photos I'd love to share, but promised I wouldn't, is of my children devouring hotdogs filled with half-metre long sausages! Or what about hot, fresh-roasted nuts like chestnuts or spiced almonds, or thin pancakes with a never-ending choice of toppings? We even visited a Christmas market inside a palace. Now that was something special! And we've been serenaded not just by revellers but by brass bands in traditional local finery. And, when you tire of wandering the markets, especially with your hands laden with goodies, there's the treat of heading indoors. Find a cosy spot and relax with a mug of hot chocolate and a strudel or a hearty meal. What is your favourite pre-Christmas treat? A trip to the markets? Taste testing festive goodies? Or maybe ignoring the preparations and curling up with a good book! As a pre-Christmas treat I'll give away a signed Annie West title to two people who comment. Ruthlessly Royal is available now from Mills and Boon UK or next month from the Book Depository. Or you could simply check out the ebook of Protected by the Prince. A common question for authors is where they get their inspiration. It sounds like a straightforward question, but it's actually got a complicated answer for me, because inspiration for my writing comes from so many different places. In the case of Charmed, there were two things about the characters that instantly came to my mind. Let's talk about Michael, the hero, first. He's an accountant. Boring, right? No way! He's the rockstar of accountants -- he's a surfer boy, an adventure traveller, and I'm sure he's done all those dangerous holiday sports, bungy jumping, jet boating, etc. The thing that stuck in my mind when I pictured him was his hair. I saw him running his fingers through his hair as a gesture whenever he was confused, or overwhelmed, or thinking things through. (Or, possibly, being driven out of his mind by passion!) One actor, famed for his gorgeous locks, came to mind. 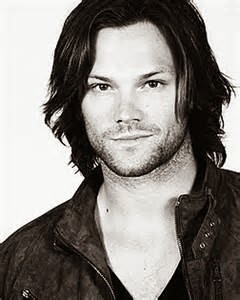 Jared Padalecki is probably most famous for playing Sam Winchester in Supernatural. He often runs his fingers through his hair in that role, and that's exactly what I pictured. My heroine, Melanie, didn't come quite so easily to mind. That is, in terms of her looks. The one thing that I was clear on very early on was her wardrobe. A strange little bit of inspiration, I know! But I could very clearly picture exactly what she would wear, and it was exactly like Nina Proudman from the Aussie TV drama, Offspring. 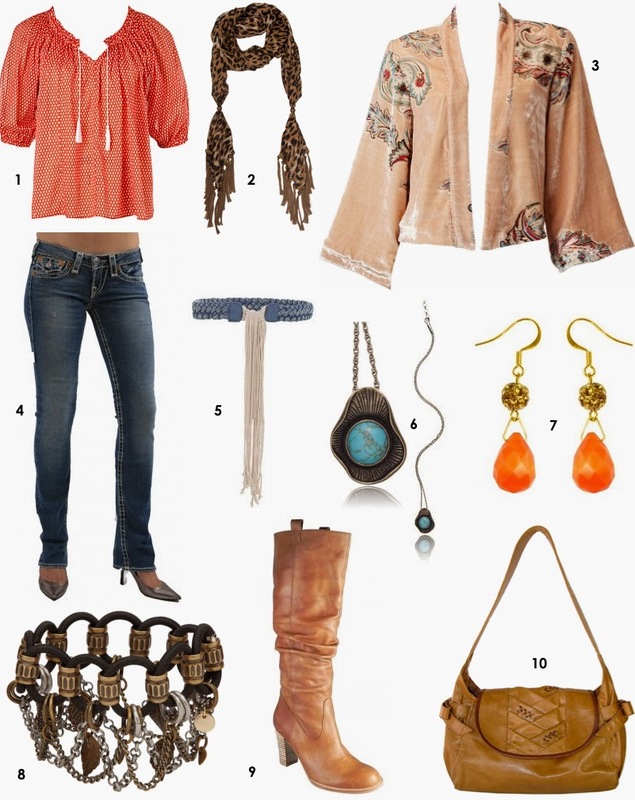 Those filmy scarves, and jangly beads, and boho-gypsy chic were very clear in my head. Mel and Michael have a few challenges thrown their direction, and they're not just about haircare and fashion choices. There's an entanglement with the magic council, a big matter in Michael's past, and pesky Aunt Gertrude always getting in the way. I hope you'll enjoy Charmed -- it was such fun to write, especially with two such quirky, inspirational characters at the heart of it! Before I go, I just want to add one other little piece of news -- you may know already, but I'm about to head off on a new adventure, living in San Francisco. This is my last blog post with the gorgeous Lovecats, and I'm saying a sad but fond farewell to all the other kitties! I do hope to come back and visit with special news every now and then. In the meantime, my heartfelt thanks to the Lovecats for being such wonderful authors to work with, and my fondest wishes to all the Lovecats readers for you comments and interaction -- wishing you all a very Merry Christmas and a great New Year! Joley McBride had no interest in Nate Garrigan...even though he'd made it crystal clear he wanted her. The rich and handsome rancher was the kind of man she'd sworn off years ago. But now, part of her beloved flying school was in his hands and Joley would do anything to get it back— including agree to his arrogant demand that she spend a month on his isolated cattle property. Could he read her mind? How did he know that she felt that way? Dale’s betrayal had made her wary of all men. Paul had bailed when she’d pulled back and she hadn’t trusted him enough to tell him why she found it so hard to give all of herself to their relationship. Any other man she’d become involved with had lasted only a few dates. And there was Patrick in the background, running her business into the hands of receivers. Until Nate had stepped in and pulled it back from the brink of ruin. His admission made her belly flip over. “So, kiss me,” Joley said, inviting him to take her lips, inviting him to take her. He covered her mouth with his in a seductive kiss. It was hot and hard and exactly what she wanted. Nate’s palms curved over her hips and he urged her closer. She held on, driven by need and rising emotion. She curled her fingers around his neck and brought them together at his nape. Joley experienced a deep jolt of desire through to her bones. Denim against denim, breast against chest, he continued to kiss her, continued to slant his mouth across hers. As the kiss went on, the heat between them grew. It was a burning heat, way down, making her want as she’d never wanted before. In that moment, every other touch she’d known was forgotten. Everything was forgotten. Her business, her old fears about losing herself emotionally, seemed to fade and fall to her feet. Nate said her name as he trailed a kiss from her mouth and along her jaw. Joley clung to him and groaned when he moved to the sensitive spot below her ear and kissed her there again and again. He bunched her T-shirt in one hand and urged her closer. A horse whinnied and Joley pulled back. “We should probably stop,” she said on a ragged breath. It wasn’t what she wanted at all. A few strides and they’d be in the tack room. Shedding a few layers of clothing and they could be naked together. A few minutes and she could press herself against him and feel every inch of his skin against every inch of hers. The word trailed off as she stepped back and pulled her shirt down over the waistband of her jeans. The kiss was over. The mood would be over too. Only, it was difficult to think of anything other than kissing him again when he stood so close. “Sure,” he said and grabbed his shirt off a hook near the door and quickly shouldered into it. Was he annoyed she’d stopped their kiss? Impossible to tell with Nate. She’d told him everything about Dale and he hadn’t judged her. He’d given her the comfort she’d craved. His arms were pure temptation. And she was tempted to stay there…forever. If only they wanted the same things. Do you like a cowboy hero? Or do you prefer an urban, sophisticated man? Perhaps you like both. 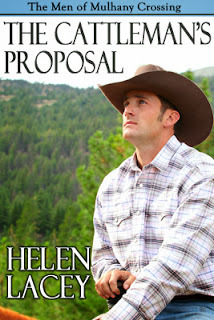 Leave a comment to go into the draw to win an eCopy of The Cattleman's Proposal. Come back next Sunday, when the winner of today's giveaway will be announced and a smooch from From hero To Daddy by Sue Mackay ....... will be posted! Who doesn't love the festive season? Catching up with friends and family while enjoying chocolate, champagne and gorgeous food is always a treat. On Monday night I went out with my writing group for our annual, end of year, cocktails and dessert night. Except this year we had dinner with our drinks, not just dessert. My hips took a hit with roast salmon followed by French meringues and cream. Yeah, okay, when you do something, do it well. Did I mention the talking? We're women, probably didn't need to, but boy, are we good at it. It's so much fun. These are the people who laugh at my ridiculous goals, drink bubbles with me to celebrate my successes, and make me toughen up on the numerous occasions when things don't work out. In short, these women are very important to me, and I treasure their company, wisdom and friendship. This time last year there were seven in this amazing group. Four who still meet up, that is. Yes, there's Lovecat Barbara DeLeo in front of me, along with Nadine Taylor (our newest member), and Iona Jones. For those who have abandoned us - or so they think - the internet makes sure none of them are that far away, even Deborah who has headed to Canada. We keep everyone in the loop and know what's happening in their writing careers. We can still cheer each other up or give stick when it's needed. We have another member who has never lived in our town, let alone the South Island. Our phantom member - Lovecat, Louisa George, who manages to get a word in occasionally via texts or Skype. There is a downside to this little celebration. Iona loves to crack the whip and in January she has us putting our writing goals for the year on paper which she then hides away. None of us keep a copy, and I know I never remember what I wrote down. Just when we're getting settled with our drinks firmly in hand and the laughter growing louder Iona brings out these pieces of paper. Yes, right. Such a spoilsport. Just as well we're well and truly into those glasses by then. The laughter gets even louder, and the eye rolling can be frantic. But it's always quite surprising how many of those goals all of us have met. Which has to be celebrated in the customary way, of course. And now it's back to facing another year of tapping the keyboard and dreaming of outrageous success. Oh, and thinking up some achievable goals to put down on another scrap of paper to have a darned good laugh over next December. Do you belong to a group that's super special to you? One that supports you in your endeavours? This might be an odd thing to say, but I’m a fan of criticism. Now let me clarify that—I do mean criticism of the constructive kind. I certainly don’t want to read a scathing review that can’t (or refuses) to see any redeeming qualities in one of my stories. That’s just going to bring me down and depress me for days on end, without any reward at the end of it. However, while glowing reviews are lovely and whatnot—great for the ego—if an element of a story isn’t working for a reader, I’d rather know. The reviewer not only pinpointed my own niggle of unease with that story but she named it—angst overshadowing my story. Yes! She nailed it! What did I learn—to keep backstory as a motivating force for the characters, not to have it front and centre. Now, I have had a couple of “perfect ending” comments (mainly for The Nanny Who Saved Christmas and The Man Who Saw Her Beauty), so I do understand that in a lot of ways this is merely a taste thing—different strokes and all of that. Do I have a tendency to rush my endings? Believe me, it’s something I’m going to keep an eye on from hereon. I write these stories with the aim of entertaining and delighting my readers. I want to deliver on every level. I want them closing the pages of my books with a happy sigh. If I’m not doing that, then I need to work harder (and smarter). For those of you who might’ve read one or two of my stories, feel free to weigh in with an opinion here too. :) All thoughts will be gratefully received. So, for the writers among you—have you ever learned something from a review? And for the readers out there (yes, I know that’s all of you)—are you a fan of long, luxurious endings…or do you like it all to wrap up fast. And if I’ve just written a duet, should I write an epilogue to show my 2 couples living the happy-ever-after dream? Mandy kicked off and within two minutes I had tears of laughter streaking down my face. Mandy is so incredibly funny. She’d singled out my husband and made him blush. I don’t think I’d ever seen my husband blush. Mandy had planned to chat for twenty minutes, but everyone was still laughing after three quarters of an hour. I was then handed a glass of champagne and was installed at a table to sign books. And sign I did. Mary Ryan’s sold out of Sweet Seduction in about fifteen minutes. The whole event was a huge success. I was on such a high. But, I hadn’t sleep for three nights beforehand as I was so nervous. I’ve done lots and lots of presentations in my life, but usually I’d been presenting about a product or a service, not about my own creative efforts. Before I left for the launch, I meditated for fifteen minutes. I think I would have been a lot more nervous if I hadn’t. I learned to meditate when I used to work in big corporations to manage the stress. I pull this calming technique out of the bag whenever I’m heading for a stressful time (I know, I should do it everyday). So, what tricks and tips do you have for managing nerves? I’d love to hear. The Convenient Bride: Sienna De Luca will do anything to save her family's hotel, and ruthless Italian businessman Antonio Moretti knows it. With problems of his own, he proposes a marriage of convenience that will secure his next business deal and save Sienna's hotel. In keeping with her part of the bargain, Sienna travels to Venice with Antonio, who introduces her to a life of luxury and opulence. Antonio soon realizes he has vastly underestimated Sienna. Unexpectedly, she gets too close, and when she discovers his dark secret, Antonio's perfectly planned life begins to unravel . . .
Seducing the Secret Heiress: Diamond heiress, Charlotte Wentworth, is passionate about two things - cooking and her fiancée, Paul. Until the day she finds out Paul has been unfaithful. Charlotte flees to Europe, determined to build her own life without her family's fortune. When she meets gorgeous TV producer, Gabe Grenville, she keeps her connections secret and soon finds herself the star of his new cooking show. But how will he react when he discovers Charlotte's true identity?